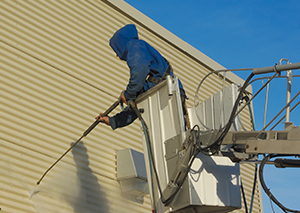 As part of most exterior and commercial painting projects, we prepare the surface by removing any loose paint, degreasing, and then pressure or power washing. Contact us if your industrial or commercial floor or exterior needs to be power or pressure washed and cleaned. Our crews work quickly and can improve the look of your business or industrial property with only a cleaning or a pressure washing and resurfacing.